MOSCOW, Russia (CNN) -- Russian officials suspect Chechen separatists in the deadly bombings that rocked two subway stations in central Moscow on Monday, highlighting a longstanding threat to the country's stability. 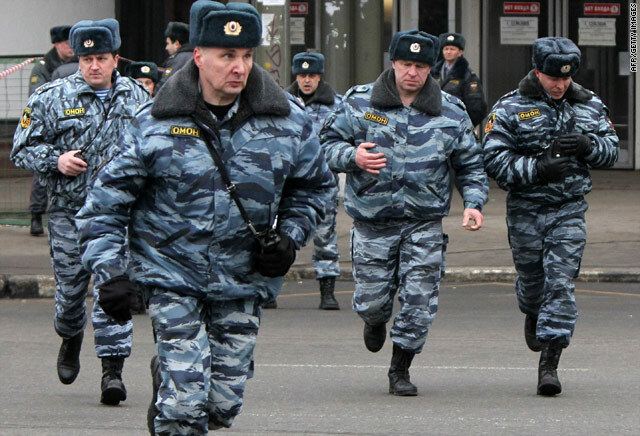 Russia's intelligence agency said preliminary indications point to "a terrorist group from the North Caucasus region," where Chechnya is located. "We consider this the most likely scenario, based on investigations conducted at the site of the blast," said Alexander Bortnikov, director of the Federal Security Service. The Russia-Chechnya conflict dates back many years and has exacted a heavy toll on both sides. Chechens have laid claim to land in the Caucus Mountains region for more than 5,000 years. Video: Why Moscow? Why now? The standard of living in the southwestern republic is poor compared with the rest of Russia. Unemployment is rampant and infant mortality is high. In addition, the Chechen population of about 1 million is mostly made up of Sunni Muslims, who maintain a distinctly different cultural and linguistic identity from Russian Orthodox Christians. In 1991, Chechnya formally announced its fight for independence, saying it never joined Russia voluntarily. Initially, the Russian government did not take the pronouncement seriously. But after a series of rebel attacks, then-Russian President Boris Yeltsin sent in 40,000 Russian troops in 1994 to quash the insurgency. Two years later, the forces withdrew -- after heavy losses on both sides. Russia and Chechnya declared a cease-fire. Aslan Maskhadov, the man who led the rebels during the war, assumed the presidency of Chechnya. And though Russia still claimed it as part of its federation, the region was allowed to operate with substantial autonomy. Still, hardline rebels continued to launch attacks. Many of the deadliest took place in September 1999, when rebels bombed apartment buildings in Moscow and the southern cities of Buynaksk and Volgodonsk. Nearly 300 people died. Then-Prime Minister Vladimir Putin vowed to crack down on the insurgency by sending in troops, a promise that partly ensured his election as president the following year. A second war followed from 1999 to 2009, killing an estimated 15,000 Russian soldiers and 300,000 Chechens. More than one-third of Chechens were displaced and the region's infrastruture was reduced to ruins. The United Nations in 2002 named Chechnya's capital, Grozny, "the most destroyed city on the planet." During that time, Russian troops drew international criticism for excessive and indiscriminate force. Human rights groups said Moscow disregarded or suspended civil rights in its fight against terrorism, including committing illegal killings. Sweeps of villages for rebels have led to mass disappearances. The government is accused of abducting relatives of rebel leaders to compel them to surrender. For their part, Chechen rebels also horrified the world with stepped-up attacks targeting civilians. Chechens held 700 movie-goers hostage in a Moscow theater in 2002. A Russian effort to free them resulted in the deaths of 120 hostages. They also were accused of downing two Russian airplanes in 2004. And they took over a school in Beslan in the North Ossetia region in 2004. When the seige ended, more than 330 people had died -- half of them children. Just as Putin proclaimed that his policies were succeeding in Chechnya, the pro-Moscow president of the region and 20 others were killed by a bomb that went off under a stadium grandstand in 2004. Still by 2009, Russia had quashed the rebel movement to the point that it officially declared the war over. Ramzan Kadyrov, a former rebel, is president of a pro-Moscow Chechen government. Rights groups say he rules with an iron fist and little regard for law. The government maintains tight controls over what is reported from the region. And groups such as Amnesty International have accused Kadyrov's administration of deaths in custody, other unlawful killings and threats to human rights activists. The insurgency itself has not so much ended as it has moved to the east and the west -- to the republics of Dagestan and Ingushetia, where rebels are fighting troops to destabilize the region.